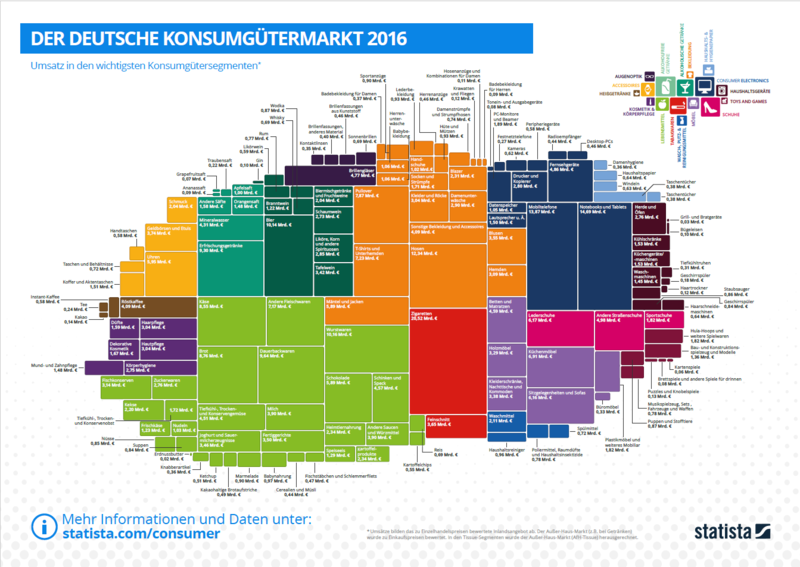 The poster shows a selection of market data from the Statista Consumer Market Outlook and provides a graphical overview of the biggest markets of the consumer goods industry in the U.S. in 2016. Detailed are more than 70 product segments across the categories food, non-alcoholic drinks, alcoholic drinks, hot drinks, tobacco, home and laundry care, cosmetics, tissue and hygiene paper, apparel and shoes. In total, the Consumer Market Outlook contains historical market data and forecasts for 29 countries worldwide that can be easily downloaded for further processing. A methodology and FAQ which detail the used sources and methods used to generate the data can be found here.